The classic novel Zorba the Greek is the story of two men, their incredible friendship, and the importance of living life to the fullest. Zorba, a Greek working man, is a larger-than-life character, energetic and unpredictable. He accompanies the unnamed narrator to Crete to work in the narrator’s lignite mine, and the pair develops a singular relationship. 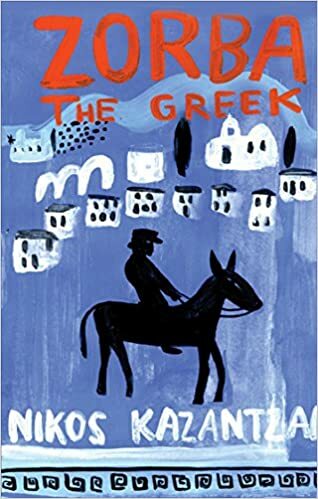 The two men couldn’t be further apart: The narrator is cerebral, modest, and reserved; Zorba is unfettered, spirited, and beyond the reins of civility. Over the course of their journey, he becomes the narrator’s greatest friend and inspiration and helps him to appreciate the joy of living. Zorba has been acclaimed as one of the most remarkable figures in literature; he is a character in the great tradition of Sinbad the Sailor, Falstaff, and Sancho Panza. He responds to all that life offers him with passion, whether he’s supervising laborers at a mine, confronting mad monks in a mountain monastery, embellishing the tales of his past adventures, or making love. Zorba the Greek explores the beauty and pain of existence, inviting readers to reevaluate the most important aspects of their lives and live to the fullest. Copies available at the check-out desk. Refreshments served. In the second floor reading area.